The healthcare industry has received a massive technological upgrade over the last decade, and while it has experienced success in adopting and utilizing the new tools and features, there's one area that could use some improvement: the digital user experience. User experience has become the focus of successful companies worldwide, and certain user experience trends have been transforming healthcare and the way the industry delivers news, updates and other information online. With this in mind, here are five ways digital transformation is driving healthcare. The blending of digital and physical interactive experiences is tied closely to the omnipresent experience, which, today, is helping to drive healthcare by providing a superior user experience to patients. Additionally, an omnipresent experience allows smaller healthcare facilities to provide the same experience one would expect to receive in a larger, more advanced facility. Indeed, an omnipresent experience, coupled with excellent customer service, can help provide a digital user experience that patients can appreciate while in these facilities. This technology can also help improve response times and decrease costs. Utilizing a cloud-based contact center gives the healthcare industry the tools necessary for delivering meaningful customer interactions. Indeed, not only can these platforms deliver and make improvements in this arena, but they can also bolster the entire healthcare digital user experience. For example, with a customer engagement platform like a cloud contact center, you can provide top-notch customer care using omnichannel capabilities. That means patients can get in contact with your organization through a variety of methods, including phone, email, live chat, video conferencing and more. Ultimately, these tools make it easier for patients to get in touch with you, as well as provide a simple and easy way for your employees to locate patient information. With more sophisticated contact center solutions in place, patients and their families can reach who they need to contact quickly. Artificial intelligence has infiltrated our lives and changed the way we pay bills, order food, find our way around a new city, re-stock the fridge, and listen to music. Beyond that, however, incorporating AI and chatbots into healthcare can help your organization provide a unified patient experience and improve the overall quality of care your patients receive. AI and chatbots can be incorporated into your organization's website to make interacting with your organization as quick and easy as possible. With telehealth, your healthcare organization can provide services to patients from anywhere in the world. Say a doctor needs a consult from a specialist in Sweden for a specific list of symptoms the patient is exhibiting and you can connect them with your patient in New York in a matter of minutes. Rather than scanning a traditional knowledge base for answers to a medical question or mystery, your healthcare organization could have the answers right at their fingertips by way of technology. Virtual and augmented reality is already changing the way healthcare providers deliver care by helping patients who are experiencing pain to keep their mind off it. Additionally, this technology helps patients undergoing serious medical procedures and treatments to better relax. Via VR and augmented reality, patients can choose from playing a game or traveling to tranquil scenery. This technology can help tremendously improve the overall healthcare digital user experience. Technology will continue to help advance and improve the healthcare digital user experience, and with the right technology, you'll be in prime position to provide a high-quality user experience. Considering the above information should give you an idea of how best to move forward with the technology you utilize. 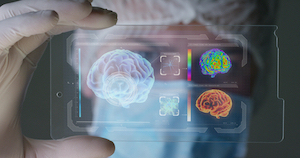 Technology is driving healthcare, and the user experience is at the forefront of it. Don't get left behind. Find a solution that meets your needs, and start implementing the technology that will help improve the overall patient experience.